Celebrities continue to show up for those in need of assistance in the wake of Hurricane Harvey’s devastating impact on Houston. Actor, singer and comedian Jamie Foxx announced last week that there will be a telethon on Sept. 12 to help raise money. The telethon will be organized by rapper and Houston native Bernard “Bun B” Freeman and music manager Scooter Braun. Foxx also donated $25,000 to global crowdfunding organization GlobalGiving. Beyoncé, Michael Strahan, Kelly Rowland and Oprah Winfrey are among the celebrities announced to participate in the one-hour telethon. Hand in Hand: A Benefit for Hurricane Harvey Relief will air live at 8 p.m. ET on all major networks (ABC, CBS, NBC, Fox, plus CMT). Proceeds from the event will go to several charities, including the United Way of Greater Houston, Habitat for Humanity, Save the Children, Feeding Texas and the Mayor’s Fund for Hurricane Harvey Relief. The telethon is set to take place in three locations, New York; Nashville, Tennessee; and Los Angeles. Director, actor and producer Tyler Perry is donating $1 million to aid in relief for those affected by Hurricane Harvey. 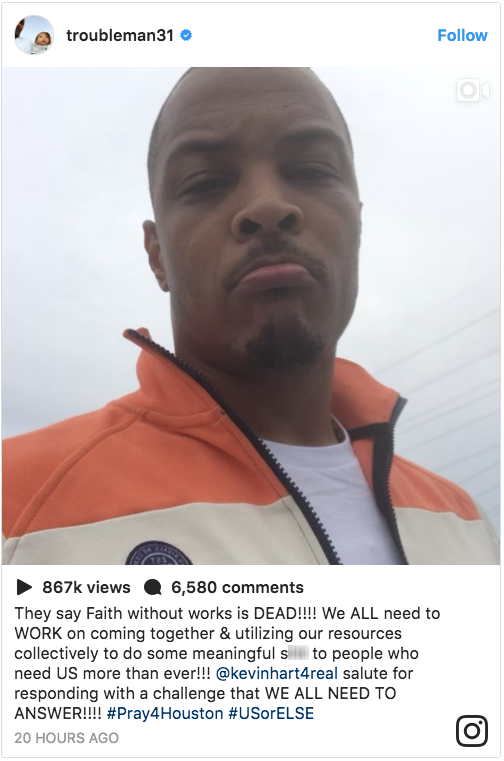 He took to Facebook on Monday to announce that $250,000 will go to Beyoncé’s pastor, Rudy Rasmus, and another $250,000 to Joel Osteen’s Lakewood Church in Houston. Last week, when Osteen was accused of not wanting to open his doors for relief to those in need, Perry came to his defense (link). Perry did not disclose where the remaining $500,000 will go. On Sept. 2, Houston Rockets point guard James Harden announced he will donate $1 million to the city of Houston to aid in Hurricane Harvey recovery. Harden spoke at a news conference at the NRG Center along with Houston Mayor Sylvester Turner, which has housed evacuees since Harvey hit the Houston area more than a week ago. The Rockets gave Harden a four-year extension in July, with sources telling ESPN at the time that it is a supermaximum extension that will guarantee him $228 million through the 2022-23 season. NBA All-Stars, NFL players, MLB standouts and celebrities continue to publicly show their support for those affected by Tropical Storm Harvey, which continues to pummel the Houston area, displacing residents. While many have escaped the rising floodwaters and pouring rain, others are still seeking refuge. President Barack Obama, Harden, Stephen Curry, Kevin Durant, Kelly Rowland, Chris Paul, Eva Longoria, Drake, DeMarcus Cousins and other celebrities have tweeted their support, pledges and prayers to the people of Houston and elsewhere. Meanwhile, many are going beyond social media to donate money and time. Houston Rockets owner Leslie Alexander donated $10 million to the Hurricane Harvey Relief Fund, which was started by Turner. “Our hearts are heavy seeing the devastation that so many of our friends, family and neighbors are experiencing,” the team said in a statement. Comedian and actor Kevin Hart took to Instagram with a call to action urging others to pledge funds. Hart said he was donating $25,000 and beckoned for other stars such as Beyoncé, The Rock, Justin Timberlake and others to join in and spread the word. Established in 2013, the BeyGood organization does philanthropic work worldwide. Houston Texans defensive end J.J. Watt started a fundraiser Aug. 27 to help the people of Houston. He originally set a goal of $200,000. After that goal was reached, he raised the stakes to $500,000. Paul’s $50,000 donation pushed the total collected by the fundraiser to $500,000. The total increased to $1 million by Aug. 28, prompting Watt to raise the fundraiser’s goal to $1.5 million. That goal was reached and Watt has raised more than $20 million. “I can’t even begin to describe what it’s like to see people come together for a common cause,” Watt said. Singer Carl Thomas posted a video on Instagram with a message that says, “This is happening now.” He is seen in the video on a boat assisting in the evacuation process. Nicki Minaj and DJ Khaled responded with $25,000 pledges. Chris Brown pledged $100,000 and took the time to express skepticism about donating to Red Cross, while rapper T.I. lent his support. HOUSTON TEXAS my prayers are wit you ! I just sent 25k your way to help all the families in need and help the city HOUSTON TEXAS 🙏🏽 @kevinhart4real I accepted your challenge @kevinhart4real bless up ! GOD IS THE GREATEST!!! The Houston Astros ownership group pledged to donate $4 million to the relief efforts. The Texans and owner Bob McNair donated $1 million to the United Way of Greater Houston Flood Relief Fund. The NFL Foundation said it would match the $1 million donation, and New England Patriots owner Robert Kraft and his family pledged to match all funds donated to the Red Cross in support of Harvey flood relief up to $1 million. Major League Baseball also contributed to the cause, joining with the players association to donate $1 million to the Red Cross and relief organizations chosen by the players. St. Louis Cardinals first baseman Matt Carpenter, who is from the Houston area, said in a tweet that he will donate $10,000 to relief efforts for each home run he hits for the rest of the season. Buffalo Bills defensive end Jerry Hughes, a native of the Houston area, told ESPN’s Josina Anderson he will donate $25,000 to relief efforts and an additional $5,000 for each sack he makes this season. My heart and prayers are with you Texas! MusiCares, a four-star charity established by the Recording Academy, started a relief fund to support members of the music community affected by the recent devastation of Harvey. The organization offers confidential preventive, recovery and emergency programs to address musicians’ financial, medical and personal health issues. Assistance includes basic living expenses such as shelter, food, utilities and transportation; medical expenses, including doctor and hospital bills and medications; clothing; instrument and recording equipment replacement; relocation costs; home repairs; debris removal; and more. ESPN.com news services and the Associated Press contributed to this report.